You know, it makes me scratch my head every time I realize God, who created the mountains, the oceans, the heavens and all forms of life, chooses humanity for company. It makes me stop and wonder when I remember that He who gave lions their majesty and dolphins their swiftness, fashioned towering redwood trees and intricate insect wings, created humankind just to be close to. God is infinitely tuned into me, to us. It’s the cry of the human heart that reaches Him above all the clamor of creation. It’s the prayer of His child He listens for more than anything else. It’s human tears He has promised to one day wipe away. It’s His human Bride for whom He is preparing a place, and her adoration that delights Him beyond what I can even begin to understand. This God, who is so tuned into me, to us, makes me fall silent with wonder. He makes me draw my breath and gasp with the realisation of being so undeservedly cherished. He makes me blush with school girlish delight that He so determinedly pursues me. He makes me yearn to sit quietly at His feet silently trying to fathom the depths of such unexpected Love. This God who is so tuned into me more and more so makes me want to be tuned into Him back…..seriously. Asleep? You say He’s sleeping? This sea would kill us all! Master, do you not care for us? I’ve never fought a storm so wild! I know we’ll soon be dead! Have power to pierce my rest! How is it that you fear? And leaving all, just follow! Thanks for the reblog David and bless you heaps. Thankyou for dropping by Paul and bless you! “He makes me blush with school girlish delight”… He is THE ONE… Blessed be His Name!!! He’s not only “tuned into us”, but….wonder of wonders…He is WITHIN us! We are one with Him! He has chosen earthly vessels to make His abode. We are His outward expression and manifestation. We, humans, are God made visible. Christ IN US…the hope of glory! Wow! As I ponder your post and fully agree and appreciate what you have to say, one word seems to best express my heart, intimacy. The Great God of all creation, who has hung the moon, and stars, and calls them by name, not only Loves me/us, He Lives within me/us. He knows me/us better than we know ourselves, and He gets us, delights in us, and only desires for us to get it. 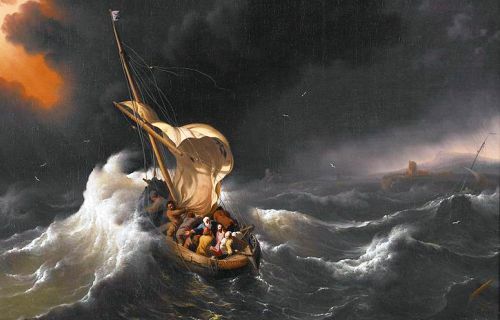 The image of the storm at sea is powerful, and as this storm raged, Jesus was resting in His Father, listening to His Father, and waiting upon His Father. There is a message here for us, to go and do likewise, rest…rest ‘in’ Him regardless of the condition of the ‘sea’. Thank you once again for your ministry of Love. Bless you Jim for your words of encouragement and affirmation that there are others like yourself on this great journey into intimacy with the One who created us, yearns for us, and understands us so much better than we understand ourselves.